J Crew has been trying some interesting new things lately (likely in an attempt to combat recent major money issues). One of those interesting new things is their recent launch of a new “Untucked” fit for their casual shirts. They don’t offer many shirts in this fit right now, but they do have a few, including some stretch fabrics. The shirts are designed to look better when worn casually and untucked than their regular casual shirts, as they are cut with a shorter hem designed to be worn untucked. In an age of custom, made-to-measure online shirting easily and affordably available (and even companies like UNTUCKit, love them or hate them), it makes sense for J Crew to start offering more precise and specialty sizing. But did they do it right with their new Untucked shirts? How do they actually fit and feel? How do they look? Read on for our comprehensive review. Like I said above, J Crew does not offer many shirts right now in their Untucked fit. Still, the few that they do offer look quite nice. They offer the classics like a blue or white poplin, as well as some nice, more colorful plaids. 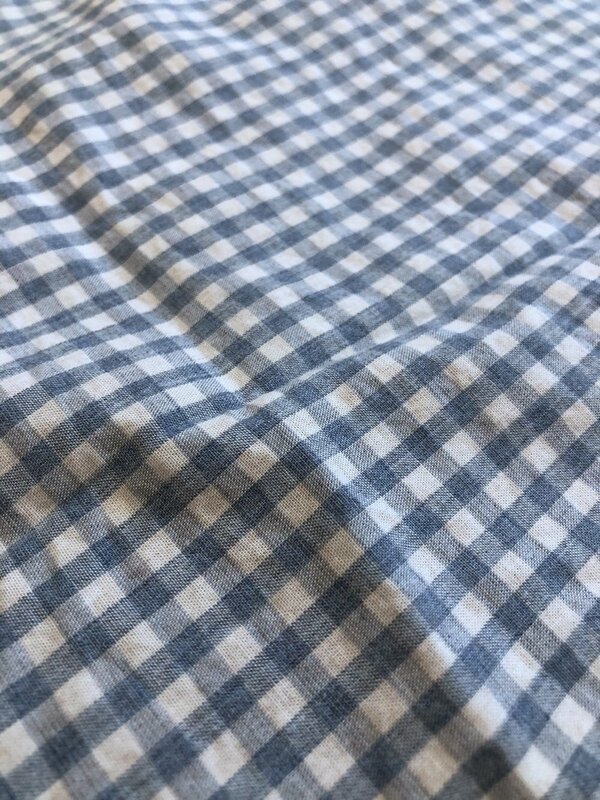 For our review, we went with a nice light blue gingham that has stretch (the fabric also has some elastane in it). I happen to really like this shirt. There is more depth to it than a typical, plain gingham with a heather to the fabric. The light color is also very nice, and goes with just about everything. It’s styled with a breast pocket, and the typical on-the-smaller side J Crew button-down collar. In all, as far as the style and design is concerned, this is a classic, typical J Crew casual shirt. No surprises here at all. If you have ever bought a casual shirt from J Crew — and what guy hasn’t? — then you know what you are dealing with here. These shirts are well made, but nothing luxurious. The stitching is all neat and clean, the buttons are plastic, but well-sewn, and the fabric is solid and comfortable. Again, no surprises here. It’s a J Crew shirt. End of story. Although I should take a moment to speak about the stretch fabric, which I really like a lot. More and more companies are offering shirts (and other products) in “technical” fabrics, or fabrics that include some sort of stretch or moisture-wicking properties. And, why not? It makes clothing more wearable, more comfortable, and more durable. And this J Crew shirt is absolutely super comfortable. It is, hands down, one of the better stretch fabrics I have tried. It’s super soft and smooth, has a surprising amount of stretch and mobility, but also does not give any indication whatsoever that it is a stretch fabric. It looks just like any other shirt, it’s just way more comfortable. Kudos to J Crew on this. They did a great job with their stretch fabric. And now, with that other stuff out of the way, the moment you have all been waiting for: the fit details. 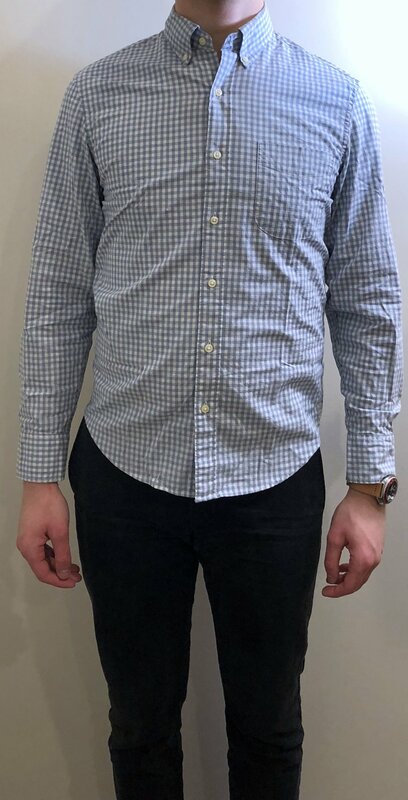 For a shirt that is advertised and designed all around the fit — and a specific kind of fit, at that — how does this shirt actually fit? J Crew says that their Untucked fit is “based on [their] Slim fit, with a shorter hem meant to be worn untucked.” But, what exactly does that mean? Should you get this shirt if you, like me, like to wear your button down shirts untucked pretty often? What can you expect when you get this shirt, and who is it really for? Chest 19.25" 18.50" 19.00" 19.00"
Waist 18.00" 17.50" 18.00" 18.00"
Armhole 9.00" 8.50" 9.25" 10.25"
Wrist 9.50" 9.50" 9.50" 10.00"
Bottom 18.25" 18.00" 19.00" 20.00"
Length 27.25" 28.25" 28.25" 27.50"
Shoulders 17.00" 17.00" 17.00" 17.75"
Note: All shirts in this chart were washed, and therefore slightly shrunk, except for the Untucked J Crew shirt. So, factor in the slightest amount of shrinkage (or more, if you machine dry your shirts) for the Untucked fit measurements. These shirts will run you $59.50 each at full retail, but J Crew always runs sales, so they can surely be had for less (think the $40’s range at least). If you are a tall, skinny guy like me, keep walking. These shirts won’t fit you at all. They are even roomier than the regular J Crew Slim fit, and the sleeves are comically short. Plus, the shorter hem length might be too short, depending on how you like it. If you are a shorter guy and like wearing your casual shirts untucked, these might well just be the perfect shirt for you. Just be aware that they do fit slightly differently than the typical J Crew Slim fit in more than just the inch-shorter hem. In the end, if these shirts work for you, they are very reasonably priced, extremely comfortable, and bring all the known and reliable quality of the J Crew you know and love.